When Tantivy‘s skipper Stuart Burnell realized crew member Brian Perry fell overboard, into the spinnaker, there was a moment of panic. “Where in the hell is Brian?” he thought. “If he’s wrapped in the chute, in the water,. . .” It was one of the those sailing moments that gets etched in a skipper’s mind, even skippers just reading this. What had started as an irritating, slow chore of clearing a wrap in a spinnaker after a gybe gone wrong, became a potential tragedy. Brian, it turned out, was sitting in the spinnaker in the water after the boat apparently rolled. A few seconds later he squirted out from the spinnaker behind the boat, relatively unharmed. But that wasn’t quite the end of it. It turns out that as a member of the cockpit crew on the J/109 Brian wasn’t wearing a PFD. He’d come forward to help clear the wrap. And Tantivy wasn’t exactly set up for a quick takedown and man overboard retrieval, with the spinnaker half down and the crew all out of position. Enter Scott Malone. Malone, who makes a habit of heading out when it’s blowing hard, was out bombing around in his 13′ RS Aero, enjoying blasting around among the big boats. He was near Tantivy as they rounded the weather mark and thought he’d make a go of keeping up with them. They started to scoot away, but wrapped their chute in a gybe, and he thought he saw his chance to catch up. Instead he saw a head pop out of the water. Burnell, who wrote about a previous man overboard recovery a couple years ago here on Sailish, says “We are rethinking Tantivy’s life jacket policy!! !” And Malone, who’s crossed oceans singlehanded, came away struck by how difficult it is to actually see a person in the water. There was at least one other MOB, ironically on the other J/109 out, Shada. Once in a while, not nearly often enough, Seattle comes through with Saturday’s conditions. 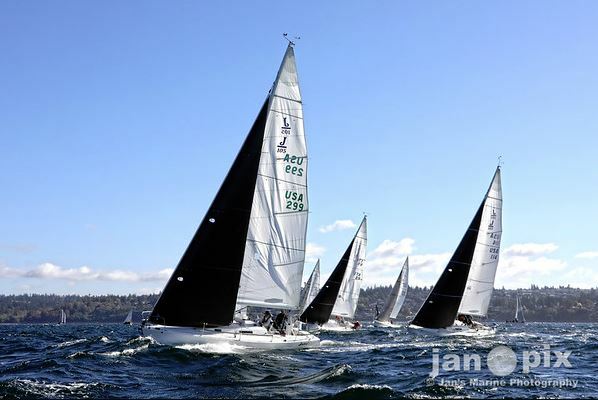 Puget Sound was carpeted with whitecaps, and you can see from Jan Anderson’s photos the day made for some great sailing. 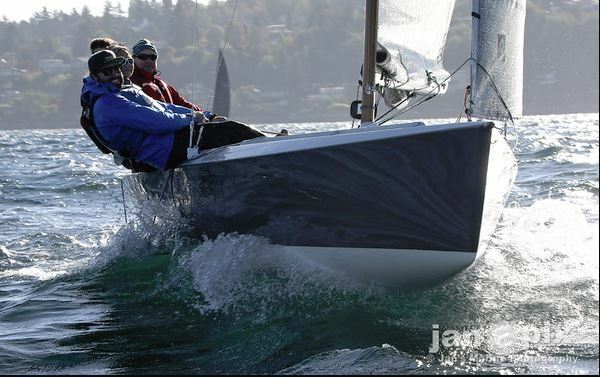 A total of 56 boats actually sailed the event, with three PHRF classes and five one design classes, four of which made up the south course right off Shilshole Bay Marina. Once again, CYC somehow set the courses in the deep water and waves and got in 9-11 races for all the fleets. Kudos. Results for the north course. Results for the south course. If Saturday was a day for the boats that could plane, Sunday was sailed in equally perfect, if somewhat more sedate sunny conditions. 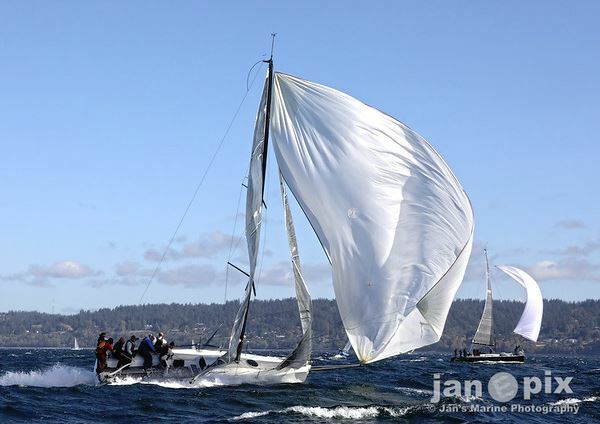 In PHRF 2 the Melges 32 Wicked Wahine won, and in PHRF 3 the Sierra 26 Uno suffered the slog to windward only to plane past its fleet downwind, usually ending up winning on corrected time. 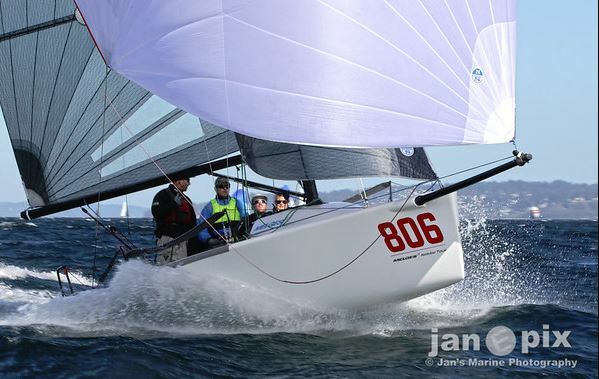 The 9-boat J/105 reveled in the conditions, with Erik Kristen winning. Pat Denney’s Here And Now and John Cahill’s Gaucho were back at it in class 5, with Here And Now coming out on top. 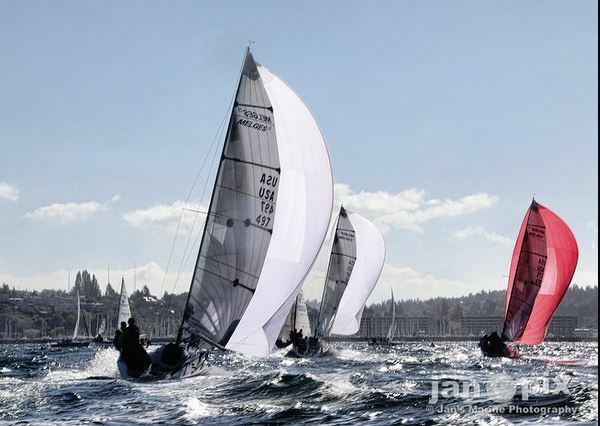 The four one design fleets on the south course enjoyed solid racing. 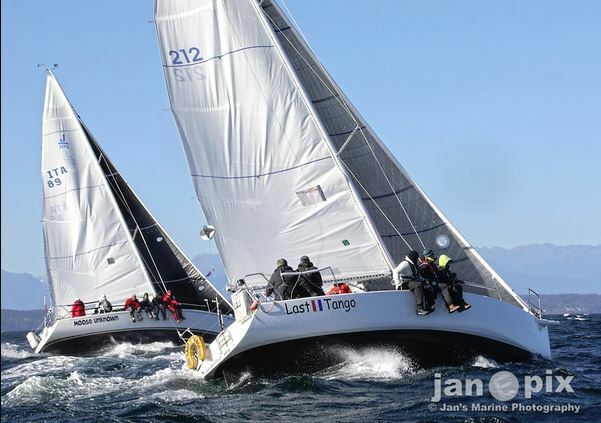 The Melges 24s lit it up downwind while the J/80s and Moore 24s put on a show of their own. 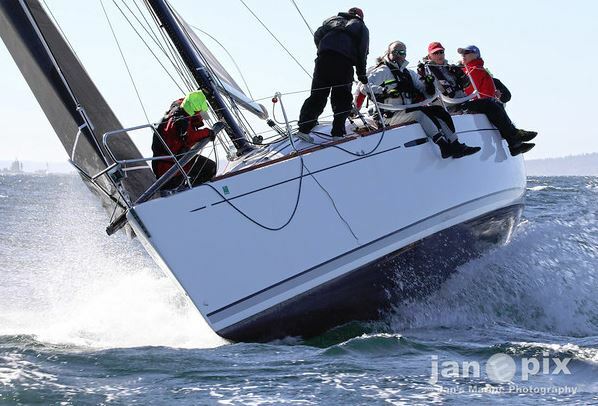 And what about the definitive non-planing one design, the San Juan 24. Well, they had fun too. 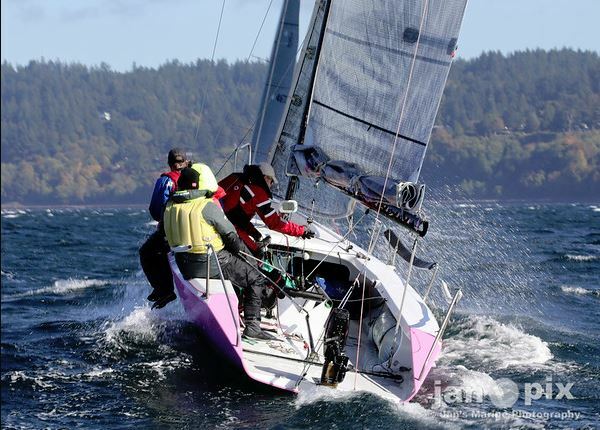 Class stalwart Ken Johnson said, ” I’m not sure I’ve been in that much wind and those kinds of waves in a San Juan 24 before.” There were no spinnakers on Saturday. 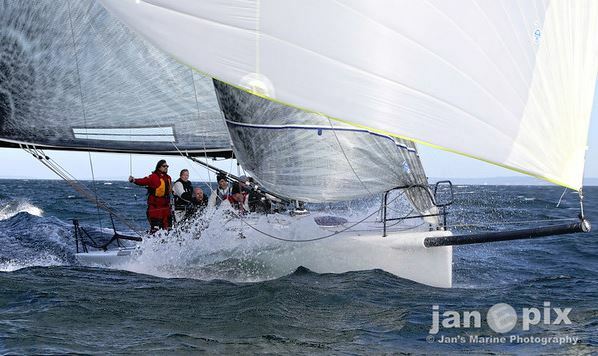 “All four skippers out there are very experienced in San Juan 24s and all knew better than to try!” Like all IOR designs, the little SJ 24 made it’s way upwind just fine, even if the comfort factor wasn’t very high. 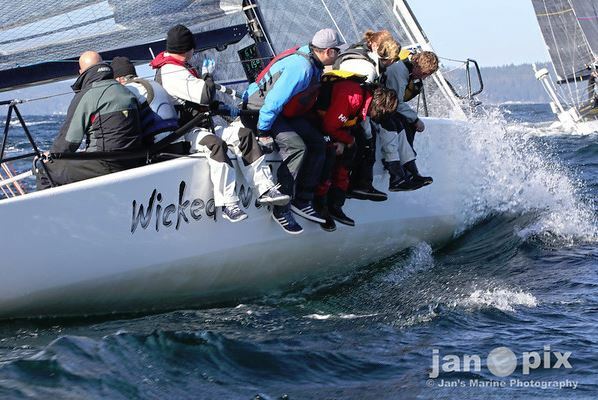 On Sunday the San Juans enjoyed some great racing in more sedate 10 knot winds, with Mark Bradner finishing up a very successful year with the win.